The contrast from Bakersfield to Vancouver, BC is stark. Well, actually anywhere inland California is a stark contrast to Vancouver, I guess. This morning is dewey, cool, and mostly cloudy. The humidity (we’d forgotten all about humidity) is over 80 percent. The high temperature was in the 60s today, and the lows are in the low 50s (Farenheit, that is). Another delightful difference is the pedestrian privileges at intersections everywhere. Turning traffic at traffic signals downtown is halted at length, sometimes, while all the lunch-seeking pedestrians cross with the light. Flashing traffic signals indicate a “pedestrian controlled” signal wherein the light only changes for pedestrian requests, not for cars on the intersecting street. Pedestrians seem to outnumber cars in Vancouver, and it seems so darned healthy. Except it’s also very practical because parking is tough to get and gas is normally over $5.50 per US gallon. The very best difference about Vancouver, though, is the little family we’re here to visit. We were last here when Eleanor was eighteen months. Now, a year later, she is thirty months and a lot of fun. She and Debbie have hit it off wonderfully. Eleanor loves her grandmommy and is enjoying her greatly. Oh, how could I forget? We finally unloaded the furniture we’ve carried in the truck almost 8,000 miles since we left High Point June 5. Stephen and I put the dresser into Ellie’s room, and we’re going to assemble the bed for Ellie later this week. Kelsey and I mounted a large mirror in their apartment, and Kelsey, Debbie, Eleanor, and I walked all around the neighborhood. People walk in Vancouver. They walk a lot. When in Vancouver, do as they do? We love walking and look forward to plenty of it while here. It’s the best way to see this cool place. We arrived today in Vancouver, BC, after 2 1/4 days and 1,200 miles of driving. The allure of visiting with Eleanor, Kelsey, and Stephen was so strong we couldn’t take any longer to arrive. We had looked forward all Summer to seeing them. The seven-week Airstream caravan (Jul 5 – Aug 24) seemed a little longer to us because it was the only thing keeping us from being in Vancouver with them. Finally the caravan ended in Eureka, California and we started north to see Debbie’s 30 month old granddaughter, Eleanor. First, though, we needed to take a two-week detour to Bakersfield to be with our good friends, Jerry and Ann. We had never towed the trailer over five hundred miles in a day and were facing 750 miles between Coos Bay, Oregon and Bakersfield, California. We were sure we could manage the fifteen hour drive since we both are experienced towing the Airstream. The drive turned out very well and we wouldn’t have wanted to be anywhere else than with our friends. Ann and Jerry finally made their escape from Bakersfield back to Charlotte, NC last Friday. Their Airstream friends all regrouped and mapped out their respective trips from Bakersfield. The Williams and Welchs were glad to be able to caravan back east together. Deb and I looked at the almost 1,200 miles between us and the kids and decided we wanted to do it as quickly as we safely could. Two drivers on excellent roads, alternating responsibility for driving, could do this in one really long pull. But we prefer not to tow at night and didn’t need to push ourselves so hard. Everywhere from Bakersfield to Redding was experiencing 100-plus degree temperatures so we decided we would drive north of Mt Shasta. The added elevation would almost guarantee much cooler day and night temperatures. We passed Mt Shasta well before sundown so decided to push on to Valley of the Rogue State Park in southern Oregon where we stayed several weeks earlier. The first day was an easy 600 mile trip rewarded with a nice, cool, and quiet campsite backing up to the Rogue River. This was our first time in two weeks with night-time temperatures below 75F. We had less than 600 miles left to Vancouver. We could finish the trip in one more day. We definitely want to get past Seattle on Sunday instead of negotiating I-5 on Monday morning with a million commuters. And we could arrive in our urban Vancouver, BC RV resort Sunday evening and therefore skip business-day Vancouver traffic. But we don’t want to be tired when we cross the border into Canada. And our forwarded mail is waiting for us just below the Canadian border in Lynden, Washington. The post office won’t open until 8:00 Monday. 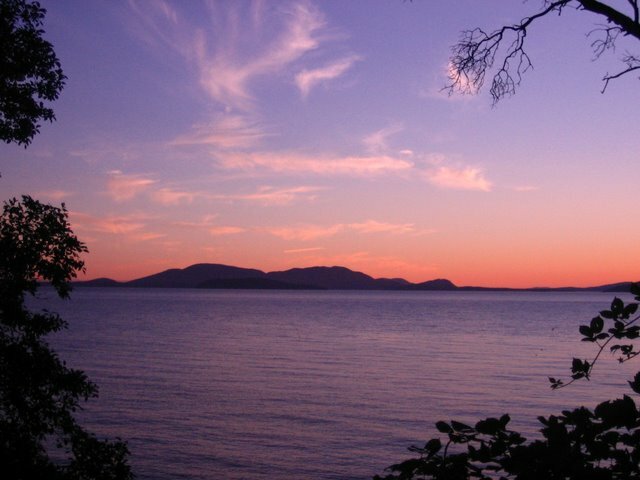 Okay, we’ll overnight south of the border in a State Park on Bellingham Bay, Larrabee State Park. We had another blessedly cool night, and this morning we washed the trailer, picked up our mail, topped off the gas tank with “cheap” American gas, stocked up on groceries, and crossed the Border midday. We arrived, after a short 112 mile day, in the early afternoon at Capilano RV Resort under Lions Gate Bridge in North Vancouver. We never intended to drive such long distances each day. We’ve said it before and think we need to keep repeating it to ourselves and trying to commit ourselves to shorter driving days. There are so many interesting things to see almost everywhere. Why hurry? Why not see things the first time we enter an area instead of doubling back? If you’ve ever taken a plane trip to jump to a destination you already know the answer. You don’t always have the time to do the things you want, until you first do the things you need to. The slow trip is sometimes a luxury just out of our reach. We’re fortunate we can pile on the miles when we want to. And we’ll keep on saying, “Shorter driving days are good, shorter driving days are good”. How Simple Is It Really? What makes life simple or complicated? It can be any combination of activity schedule, community demands, family needs, job requirements, and joys of home ownership. And how many other things? Somehow, it seems, it is some algorithm of all the pieces, and the more pieces = the more complicated. We thought of work and the many chore aspects of home ownership as the main complicators of our life. If we quit work we would simplify at least forty or fifty hours weekly. We would transfer the spare time and energy to the cars and house and lawn and church and travel. And we end up busier than when working. Quitting work doesn’t simplify anything. Unless we quit maintaining the house and yard and cars and all the associated habits, we still are caught up in all the business of staying busy. There’s no end to tasks we could aspire to, from prepping and painting to remodeling and trimming hedges and replanting, and improving the garage, and detailing the cars and I could go on forever. And the chores list went on forever. Over seven months ago we sold the cars and house and all the contents and moved out of the house into a 25 ft Airstream trailer. Our lifestyle could become simple. It is vastly simpler, to us, than our previous one. But we still are finding ourselves more externally driven than we expected. We increasingly find ourselves wanting to stay longer. The longest we’ve stayed anywhere since February is two and one-half weeks. And we still don’t see longer stays within our reach through the end of 2008. Okay, we’re beginners at full-timing. Life is much simpler for us. We have almost no assets to care for. Our household is less than 200 sf, has no high-dusting, the only floor surface is seamless vinyl, the walls are clear-coat finished aluminum, and the casework is all laminate-faced. We have one toilet, and two sinks. One bed to make. We can wash and polish all the windows in under one-half hour. Our books, the few we carry, are in one nook in the trailer. Our music is on the iPod. Our pictures are on the laptop. Nothing “goes missing” on us for long. There just aren’t many places to look before we find it. We have almost no routine maintenance to keep us busy. We have far fewer possessions. And we can focus on our interests better, we hope. We have a lot of time for reading. Much more time than we used to. And we can sight-see when we want to. I’m studying for my next amateur radio license. Deb’s working on a needlepoint project. I enjoy small projects, like how I’ll route the XM radio’s antenna into the trailer or arranging antennas for cb and amateur radios into the trailer. These are really simple things. Our most complicated issue is our travel route and destinations for the next quarter-year. And driving through Chicago’s interstate system or Vancouver’s downtown. Still, life is simpler. For now. Ann wanted to get home RIGHT NOW. The best way is non-stop flight from LAX to Charlotte. Yeah, we know the hurricanes are zoomin’ around the Carolinas. We carefully checked this out. Charlotte is over 150 miles inland, as the crow flies, from the coast. And a whole bunch of rain in Belmont, NC, spinning off a coastal hurricane is a heap better than California desert temperatures in early September. We know the Bakersfield area desert temperatures can get a lot hotter. They don’t have to. We’re all ready to leave anyway. Trust us on this. We drove with Jerry and Ann to LA last night and stayed in a sweet old Travelodge Hotel next to the airport. Travelodge’s Sleepy Bear’s image is still on the soaps, the paper, the bill, and the signs. Our ground floor rooms opened up onto little patios surrounding the pool courtyard, ornamented with huge jade bushes and banana trees under the palms. 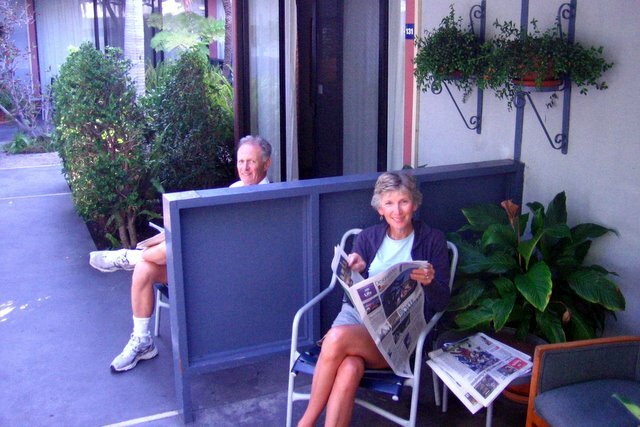 We ate our breakfast together outside and read the paper awhile. Then we loaded up into Jerry’s truck and drove the one mile to the USAIR terminal. Debbie hopped out and helped Ann and Jerry get to security before she gave them both big hugs and sent them off. I’d been dreading, all night, the drive out of LA on I-405. This is an incredibly crowded and jammed-up piece of six-lane (each way) highway, and confirms what we believed anyway. We don’t want to commute anywhere. People who do this (I apologize if you do) either are, will be driven, nuts by this kind of environment. Our blessing is the timing of our departure. We left LAX at 1000 hrs and had the rubber-band or yo-yo traffic jams, where everyone goes fifty mph then five then up again then not, until we were out near Van Nuys. Despite this we made our 110 miles in just over two hours to return to Bakersfield. Well heck, I could commute too, right? No way! I was so glad when traffic opened up and we could set the truck on cruise and tie a rope on the steering wheel and take a nap. Well, we could have, the road became so straight once we came out of the mountains and north of Lebec. What a difference one hundred miles makes. And not so much the distance as the benefits from irrigation. We left the green green grass of LA’s homes and businesses and headed up through the mountains and down again, heading north. The landscape became very stark and forbidding. No houses and the trees are only in a few pockets out in the distance. 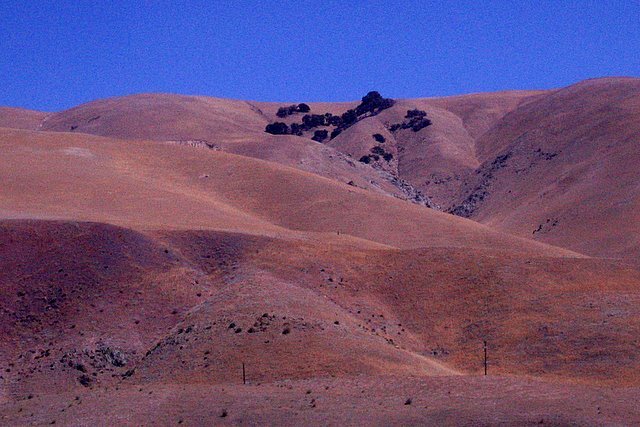 The panorama is mostly a set of nutmeg browns with a few accents of grey stone and charred desert grass areas on the hills. We’re back in Bakersfield for the night after a surprisingly easy drive today. Ann and Jerry have made it to Belmont, NC. Debbie and I went to the swimming pool for a little while this afternoon, relaxing before our three long driving days to Vancouver, BC. We’re glad to have traveled into, and out of, LA without incident. We may return, but we don’t know why we would. There are so many other areas more inviting to RVs than the LA highways. One day in LA is enough. 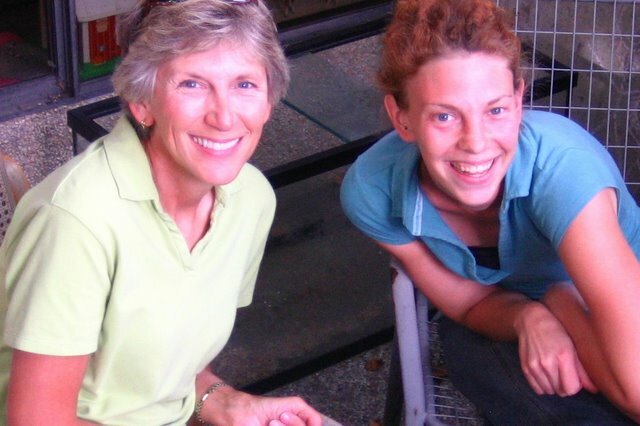 Yesterday is most remarkable for Ann’s release from the hospital. We had a new experience first, though. We took Pepper (their miniature schnauzer) to the groomer for her haircut and other spa treatments any little girl puppy should have. Debbie and I had neither one done this before, so it was a little comical as we tried to describe what we thought we were supposed to have done for her. “Okay, what’s included again in the total grooming package?” Pepper was great and pretty calm, considering the environment, so we left for the hospital to check on Jerry and Ann. Ann has been very anxious to get out of the hospital and start resting at home or anywhere else but the hospital. We found her sitting up, preparing to don her street clothes. One last IV bag, a couple visits from staff members, receive her discharge instructions, and Ann is ready to leave by early afternoon. We walk out with her, get her into their truck, then we scoot over to pick up Pepper then meet Jerry and Ann at their camper. Pepper displayed unbounded excitement seeing Ann for the first time in over a week. Ann now has one mission: rest. So many experiences come and go without challenging or, perhaps, significantly expanding us. Getting Pepper into, and out of, the grooming spa was a little interesting and a funny experience. No big deal for either of us, taking someone’s dog for a little clipping. Sometimes we choose experiences we wouldn’t avoid for anything but we can wish didn’t happen. Having our good friends in a very precarious situation so far from home has been a scary and difficult experience. Our fellow Airstreamers all over the country offered help and prayers for Jerry and Ann. Many were able to drive to Bakersfield and visit and offer hugs. Jerry and Ann needed support and we feel richer for having seen how everyone rallied to help. This was our first Labor Day as full-timers. We spent it at the Bakersfield RV Resort, and dedicated ourselves to not causing anyone else to labor on our behalf. Sort of a zero day, in the backpacker jargon, where we just relax and enjoy the day. We started the day reading Sunday’s and Monday’s daily papers (whoops, people labored today to get it to us) and enjoying a gloriously cooler day than the preceding several. I enjoyed watching Querry push Nadal hard in the US Open, and following the hurricane’s attack on the Gulf Coast. And we couldn’t help but notice the quick reduction in population at this RV resort. We spent several days here last week before everyone piled in for the weekend. Friday, before Labor Day, the park visitor population went from around 40 to perhaps 400. So today, we experienced a large sucking sound as everyone left, returning to their communities and jobs and schools. I’ll be able to swim laps diagonally in the swimming pool again, and there will be a lot less noise and activity around us. The RV resort is well-designed to accommodate the larger crowds so we never felt any problems from the great number of people here. But like a college town during summer break, it’s nice to have the place a little more to ourselves again. Deb invited our friends, Jerry and Ann, to have dinner with us the next couple evenings. Jerry is very hopeful Ann will be discharged sometime tomorrow, and we offered to pick up some groceries for him and also so we could fix dinner for them. So we headed to the grocery store (whoops, more people labored on our behalf) after visiting the hospital this evening. We left the grocery store late and drove after dark to the RV resort. It’s funny, in almost four years of towing we have towed the trailer after dark only once (leaving Oregon last week at 5:00 a.m. for Bakersfield) and only rarely drive after dark. Labor Day like buying gas for the truck, project supplies from Home Depot, haircuts for both of us, grooming for Ann’s & Jerry’s schnauzer, and a few things from Camping World. Today was a nice day for hanging out around the RV resort, staying cool, and relaxing. And we did our best to minimize anyone else laboring for us.